Of all the kid-specific bike brands, Pello is (in our opinion) the most under-recognized. With a range of high-quality bikes, Pello offers lightweight, durable bikes at a competitive price point. If you’re not familiar, do yourself a favor and get familiar. The Pello Reddi is the company’s 20″ single-speed offering. (They also offer a 2-speed option–read on for details). The bike is ideal for kids who aren’t ready for the added complexity of gears (or the weight), and who may not yet fit on other 20″ bikes with higher minimum standover. At a mere 17 pounds, the bike performs well both on and off-road, and is one of our top picks for bicycles for 5 and 6-year-old kids. The Pello Reddi is the ideal size for my 5.5 year old who swaps between a 5T and 6T pant. He has plenty of standover clearance on the bike and easily manages the 22″ minimum seat height. We recommend the bike for kids with a minimum inseam of 19.” This is lower than most 20″ bikes, so if you are ready to move your child to a larger wheel size, but they are on the shorter end of the spectrum, the Pello Reddi makes a good pick. The other thing we love about the Pello Reddi is the weight. At 17 pounds, it is lighter than most 20″ bikes we’ve looked at or tested. My son immediately noticed this weight difference and has commented multiple times about how light the Reddi feels. 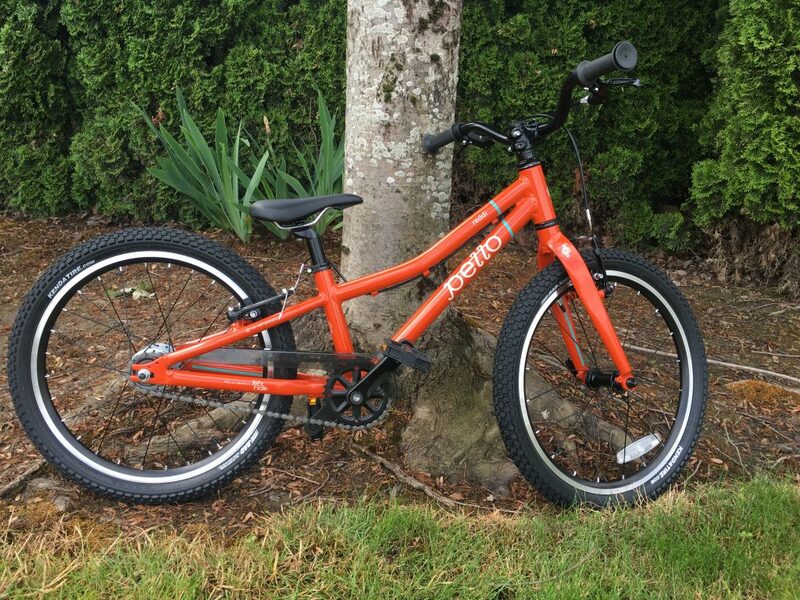 Pello hasn’t scrimped on the build of their bikes. The Pello comes with brand-name components including a Cane Creek headset, Kenda K-Rad tires, and Tektro handbrakes. All this means that the bike both provides a smooth ride and is guaranteed to last for the long-haul. There’s no doubt that the Reddi can survive a couple of years of abuse and still be handed down to a younger sibling or sold on Craigslist. The only thing we wish the Reddi has that it doesn’t is a quick release seatpost collar. A quick-release is convenient for dropping the seat at the bike park or pump track, and helps with those seemingly overnight growth sports. Fortunately, this is an easy and inexpensive DIY upgrade. The only other component that’s a bit meh is the plastic chainguard. While we appreciate that it isn’t some sort of giant metal monstrosity, the plastic is prone to breaking (as we discovered on our son’s Romper), and is more obtrusive than those on some of the other higher-end kids’ bike brands. We assemble a lot of bikes, which means we’ve seen it all, and we were impressed by how quickly and easily we were able to build up the Reddi when it arrived. The brakes required no adjustment, the tires were adequately inflated, and all required tools were included. 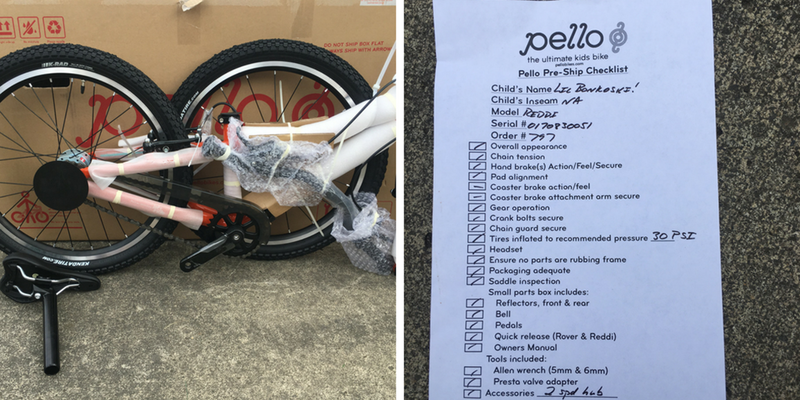 The bike also came with a pre-ship checklist which showed that it had been thoroughly checked by a mechanic prior to shipment, which explains the ease of assembly. Well done. Easy assembly. Comes with pre-ship checklist. Although many bikes begin to introduce gears at the 20″ size, if kids haven’t yet mastered other skills–braking, cornering, climbing, etc–adding another dimension the mix can be overwhelming. Adding gears to a bike also adds weight. For this reason, we appreciate the Pello has offered a 20″ bike with gear and a 20″ bike without gears. The Reddi is their singlespeed offering. 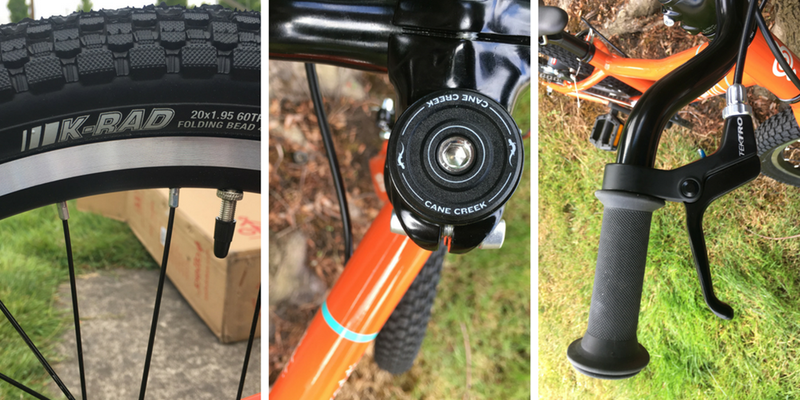 Pello offers an optional SRAM automatix 2-speed hub (which we love) and had installed on the bike we’ve been testing. It automatically shifts to a harder gear when your child starts going fast enough. This is a nice middle-ground between a single-speed drivetrain and a rear derraileur. Unfortunately, SRAM has discontinued the manufacture of this hub so there are a limited number of these wheels in the Pello inventory. If you are interested in this option, order sooner than later. The paint job on the Pello Reddi is lovely, and we can assume it will hold up over time as well as the paint on our son’s 14″ Pello Romper did. The orange color is pleasant (not overly bright), but I like it because it helps me spot our kiddo from quite a distance. That said, orange isn’t going to be for everyone, and it is a bummer that the bike doesn’t come in any other colors. We’ve tested the bike both on and off road and it performs well on either. 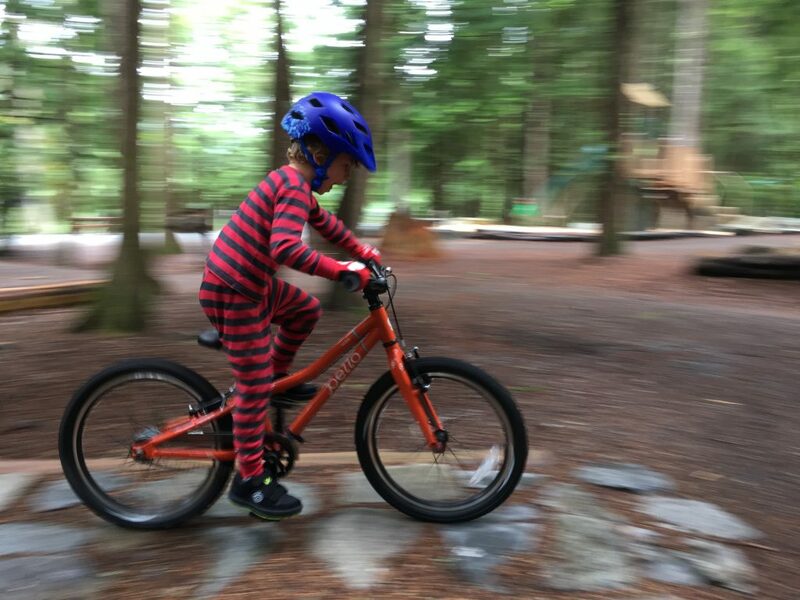 My son likes the upright geometry and raised handlebars for negotiating obstacles at the bike park, as well as riding longer distances comfortably on pavement. On his first ride on the Reddi, he powered thru 10 miles of paved bike path with a couple hefty climbs. We also tested it on the wet, rocky, rooty trails on Squamish, BC and he was able to rock and roll. Indeed, the Kenda K-Rad tires are knobby enough to ride on singletrack but don’t cause undue rolling resistance on pavement either. Overall, this is a great all-around bike for young kids no matter how you plan on using it. 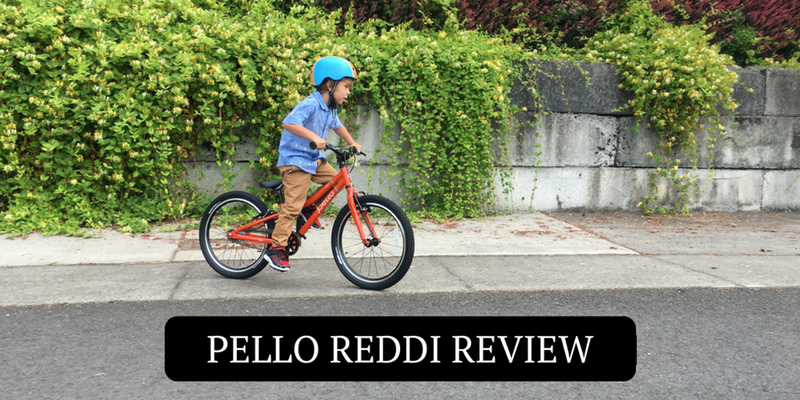 Both the Pello Reddi and the Pello Rover are 20″ bikes, though the geometry and build differ slightly. The Reddi is ideal for younger, smaller riders thanks to the low standover height and shorter reach. The Rover has a longer top-tube and less of a slope. 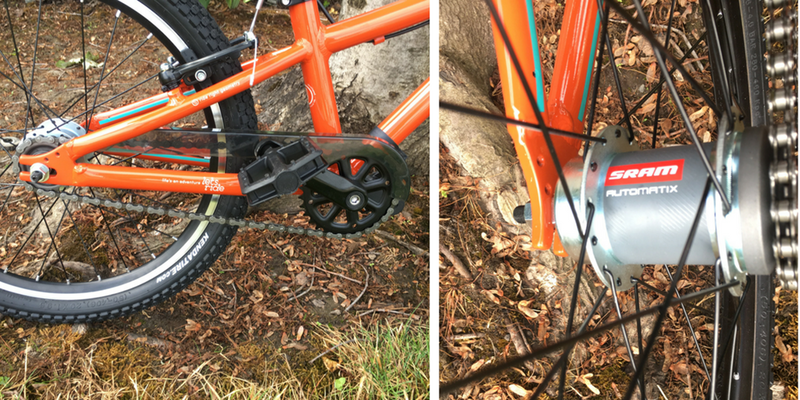 Additionally, the Rover adds a 7-speed derailleur which is awesome for kids who are ready to add gears but adds weight and complexity for those that aren’t. How does the Pello Reddi compare to other 20″ offerings? You’ll notice that it is one of the lighter and more cost-competitive builds available. The Pello Reddi falls on the smaller side of the 20″ bike spectrum which makes it ideal for kids who don’t have the minimum inseam for most 20″ bikes but are ready for the bigger size wheels. The singlespeed drivetrain (or the optional SRAM Automatix hub) keeps things simple and lightweight. Thanks to the reasonable price tag and the brand-name components, we think this is one of the best buys out there.